Prolonged exposure to stress can cause chaos to your mind and body. 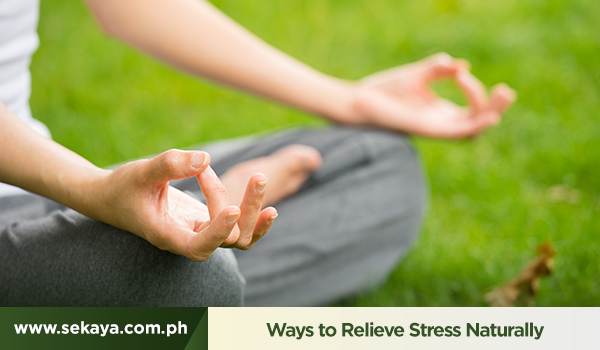 While there’s no way of controlling it, there are gentle yet effective ways on how to relieve stress. When you have a lot on your plate, de-stressing by dropping by the gym is not an option.What we often miss is that the best stress relievers are just around us. Keep your stress level to a minimum with these easy, natural ways. While there aren’t as much muscles on your head compared to your body, massaging your scalp helps you relax by promoting healthy blood circulation and the release of dopamine. As a bonus, scalp massages stimulate the release of natural oils that improve hair health. Retreat to a few minutes of tuning into your favorite beats. See,music affects your mood and, to some extent, how your body responds to a situation. Music with slower tempo can relax your muscles and calm your mind. Have a refreshing medley of mints and citrus with a mind-calming serving of Happy Days. Regular exercise regulates various physiological processes, including promoting ideal sleep/wake cycles, blood sugar levels and heart rate. Exercise has also been proven to reduce stress and anxiety with the release of endorphins in the brain. You can choose to awaken your muscles with short office workouts or work on your mind and body connectedness with a 10-minute yoga routine. When stress starts to affect your body, your breath becomes short, shallow and quick. Be mindful and begin reversing this by practicing the basic breathing exercise of taking 8-second inhales and exhales. A short break with nature pulls you out of a stressful series of events and even energizes you. Vitamin D from the sun relaxes your blood vessels and elevates your mood by improving your blood flow. Commit to that moment. Have a de-stressing cup of Jasmine Fairwhile you take your time with nature. Find nature’s gentle way of empowerment in every Sekaya botanic infusion.